To the untrained eye, what makes one type of elephant different from another might seem trivial when compared to what these enormous animals have in common -- but appearances deceive. Genetically, African and Asian elephants are so unlike each other that biologists group them into two entirely separate categories, or genera, respectively Loxodonta and Elephas. Depending upon the nature of lesser differences among members of the same genus, these categories are further broken down into species and sub-species. In general, female elephants, called cows, are smaller than males, called bulls. The range of the African savanna elephant, Earth's largest land mammal, encompasses 37 African nations. According to the World Wildlife Fund, this animal's average length is 19 to 24 feet, its height at the shoulder 11 feet and its weight 6 tons. The shape of their large ears, which help to keep the elephants cool by radiating heat away from their bodies, resembles the African continent itself. The tip of its trunk, which it uses for smelling, breathing, taking showers, trumpeting and picking things up, has two protrusions called "fingers." Both bulls and cows have tusks, although the tusks of the bull are usually longer. In 2010 analysis of the DNA of savanna and forest elephants revealed that their differences were so much greater than previously suspected that many biologists felt that they should be reclassified as two separate species. National Geographic supports that position, but points out that the species status of elephants is an ongoing controversy. 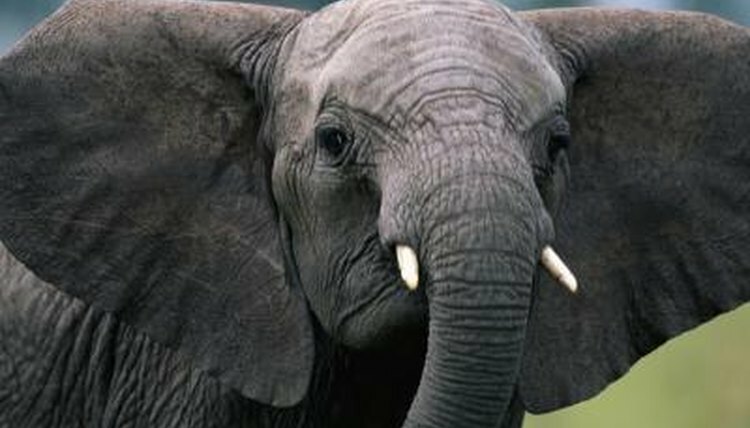 To the WWF, on the other hand, the forest elephant, only about half the size of the savanna elephant, remains a "distinct subspecies." Forest elephants, which live in the Congo Basin, have darker skin and different head, tusk and bone structure than their cousins and haven't shared a common ancestor for millions of years. An Indian elephant is smaller than an African savanna elephant -- but not by much. On average, an adult male is about 21 feet long, 10 feet tall at the shoulder and tips the scales at 5.5 tons. The ears of the Indian elephant are much smaller than those of African elephants and resemble the shape of India itself. The tip of their trunks have only one "finger." While the tusks of bulls are usually thicker and more curved than those of their African counterparts, Indian elephant cows either have very small tusks or none at all. The Asian elephant "family" consists of the Indian elephant and three subspecies, one of them the baby-faced Borneo pygmy elephant. That name is a little misleading because with a height averaging 8.2 to 9.8 feet at the shoulder, this is no miniature pachyderm. In size, the Sumatran elephant, measuring only 5 to 9 feet at the shoulder, is the smallest of Asia's elephants and classified by the WWF as "critically endangered." Sri Lankan elephants, measuring 8 to 10 feet at the shoulder, can weigh from 4.4 to 6 tons. They also have blotches of depigmentation on their ears, face, trunk and belly. What Are Some Unique Internal Structures of a Giraffe?